A scored survey is one in which you assign points to some or all of your question choices, and those points add up to the survey’s total score. Scored surveys can be used for tests, quizzes, assessments, and almost any other type of online survey or form where you want to measure your respondents’ performance, knowledge of a subject, overall satisfaction level, etc. As a respondent progresses through the survey, his score is tallied in total and also per page. At the end of the survey, you can tell the respondent his score, show him a message that’s conditionally based on that score, keep the score private, or send an email message/alert with the score to the respondent or someone else. 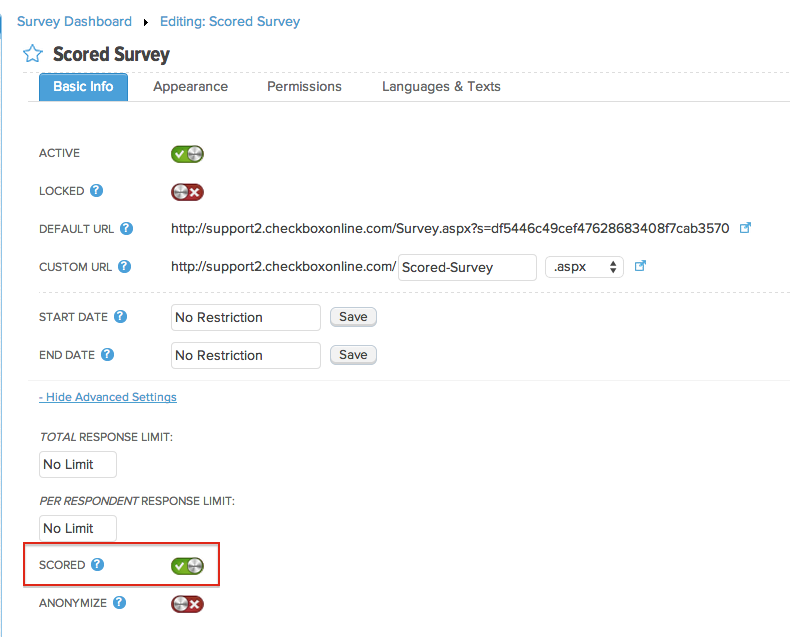 Any online survey in Checkbox can be made into a scored survey by following the steps below. You’ve now enabled scoring on your survey but, in order for a score to actually be calculated when someone takes your survey, you need to assign points to your answer choices. 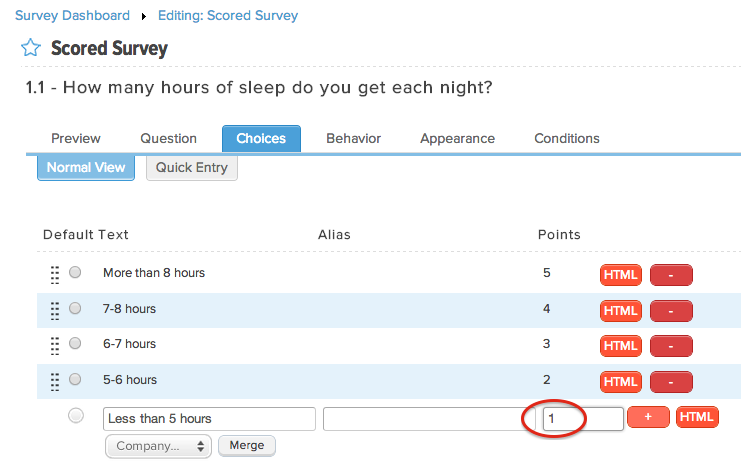 You can assign points to all questions/answers in a scored survey, or just certain ones of your choosing. To add points, simply add or edit a survey question, navigate to the choices tab, and enter the number of points you want to assign to each answer. Point values can be added to Radio Button, Checkbox, Dropdown, Matrix, and Image/Text Slider questions. NOTE: Scores are automatically calculated for NPS, Numeric Slider, and Rating Scale questions based on the answer choice given. 1. View Scores on Reports and Exports – Each respondent’s score will be automatically included in the data export when you export your survey responses. You can also choose the Average Score or Average Score by Page item when creating a Summary Report if you want to see the average score for a certain question, page or the entire survey. 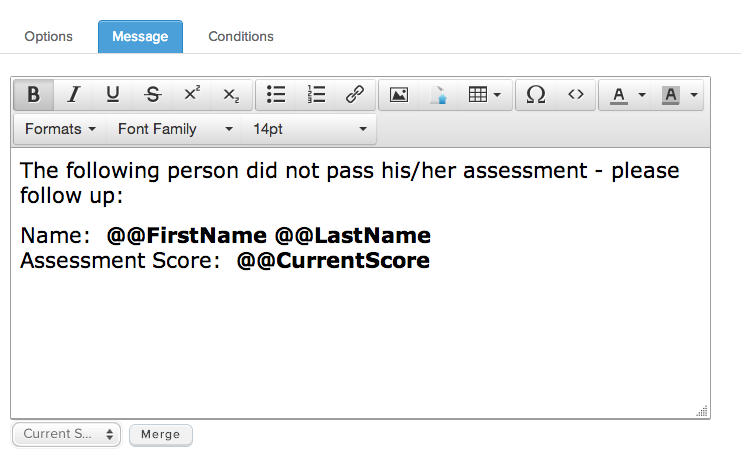 The Scoring Message does not automatically show the respondent’s score to them, but you can merge the survey score into the message using the merge code @@CurrentScore. 4. 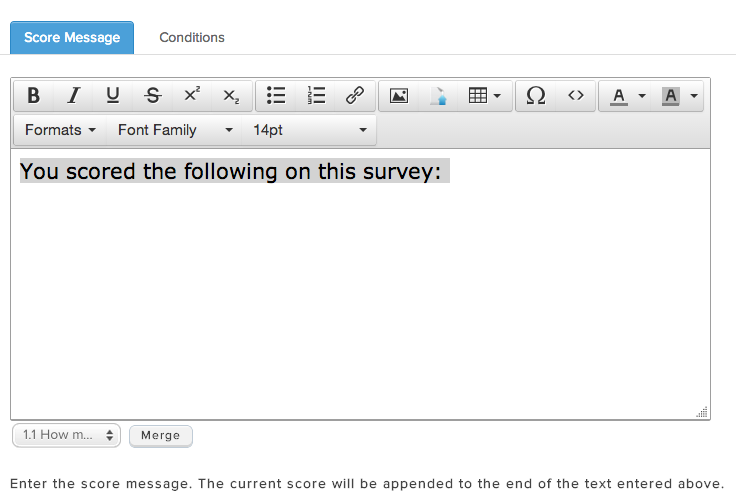 Add an HTML/Message Item – You can merge the total survey score or the score of a certain page into an HTML/Message item by choosing Current Survey Score or Page X Score from the Response section of the Merge dropdown under your HTML item. This will give you basically the same results as the Current Score item, except you have a little more control over the formatting. Again, you can show the same message to everyone or create different messages that you show/hide based on conditions. 5. Set up an Email Alert or Email Response – You can send an email alert or email response that includes the respondent’s score either to the respondent or to someone else. 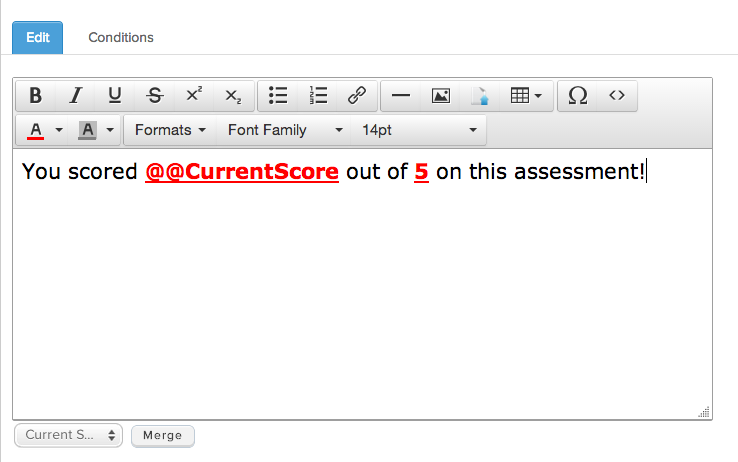 Simply merge the Current Survey Score or Page X Score into the body of the email. 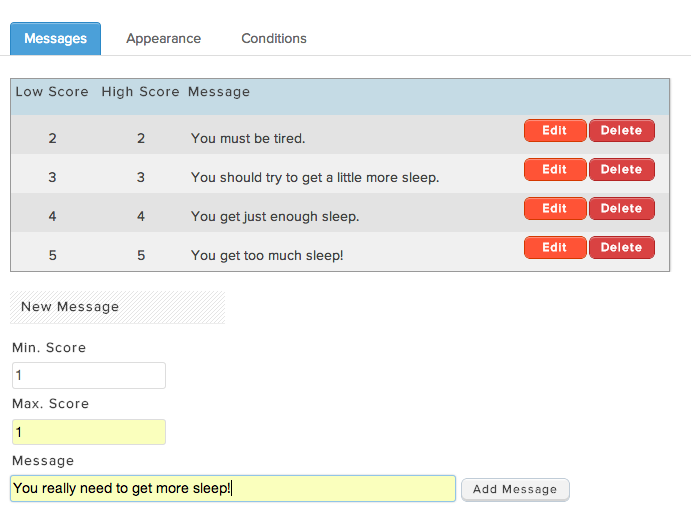 You can even set conditions on the email alert/response so that the email only sends if the person receives a certain score or score range. For more detail on how to set up and manage email alerts/responses, please see our guide on this topic. Survey questions, messages, or action items like automatic emails can be displayed or triggered based on the score of a survey or survey page. For more general information on Conditions, please see our Conditions Guide. To set up a condition based on the survey score, add your survey item and go to the Conditions tab for that item. In this example, we will add a Message Item to the Completion Page of the survey if the respondent scores greater than 80 on their online assessment. 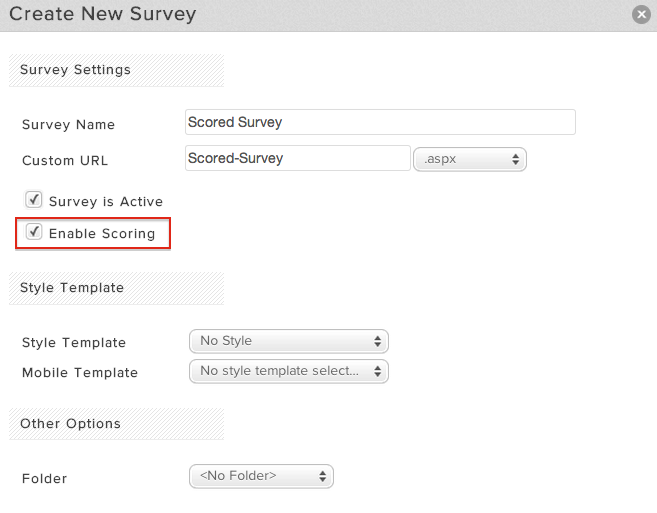 Select Current Survey Score as the Source to base your condition on the score for the whole survey. Select Page “X” Score to base a condition on the score of a single page.